At a cake club meeting that Islander had attended, one of the members brought in a curious cake called choco-flan. It was a doubly delicious dessert of chocolate and custard. It is also popular among her Mexican friends whose country is known for xocolatl y flan. 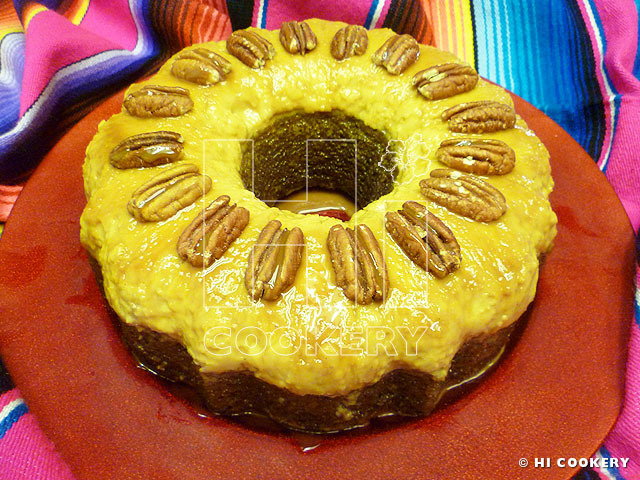 Islander added Texas’ state nut, pecans, to decorate the top of the cake for a Tex-Mex taste. Thanks to her Mexican friends for introducing this recipe to us. In their honor, and as an homage to all our Hispanic friends, we made this cake in observance of Hispanic Heritage Month. Muchas gracias, amigas. Grease a 12-cup bundt pan. Then pour about a cup of caramel to coat the sides and bottom. Set aside. Prepare the cake mix as directed on the box by combining the cake mix with water, oil and eggs and blending into a smooth batter. Pour the cake batter over the caramel. Set aside. 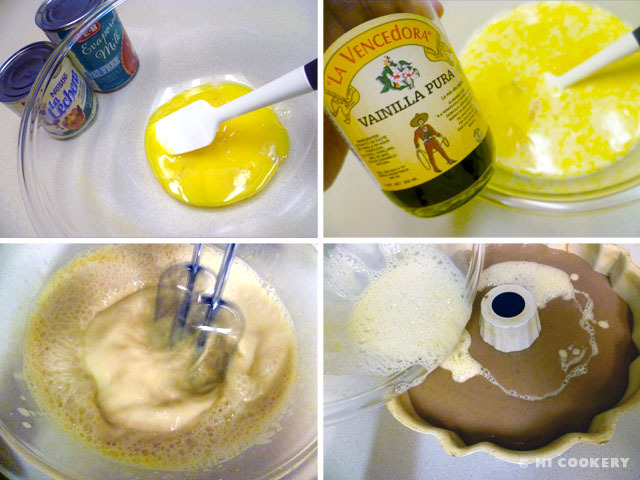 Make the flan by mixing the sweetened condensed milk, evaporated milk, eggs and vanilla. Pour the flan mix over the cake. It will sink to the bottom. 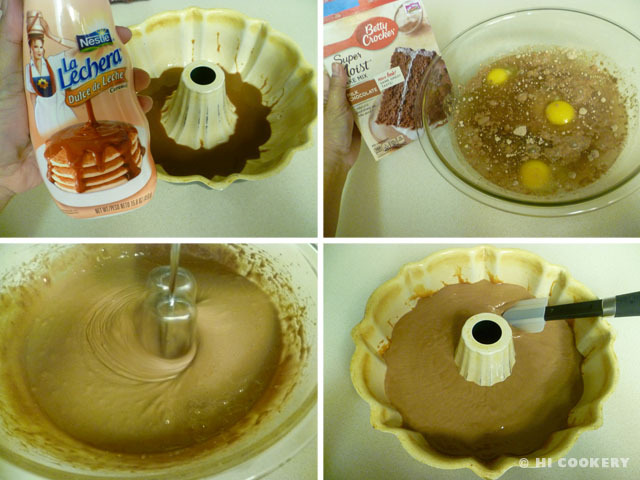 Place the bundt pan in a larger pan. Pour boiling hot water in the larger pan up to the middle of the sides of the bundt pan to make a “water bath”. 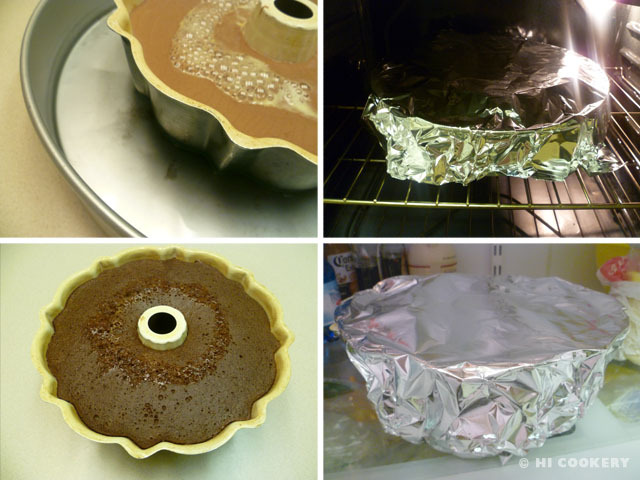 Mist a piece of foil with cooking spray and cover the bundt pan with the sprayed side down (this will prevent the risen cake from sticking to the top of the foil). Bake in a preheated oven at 350 degrees F for 50-60 minutes, testing the cake for doneness. Remove from the oven and let cool to room temperature. Place in the refrigerator to allow the flan to chill and solidify. Take out from the refrigerator and carefully invert on a plate. 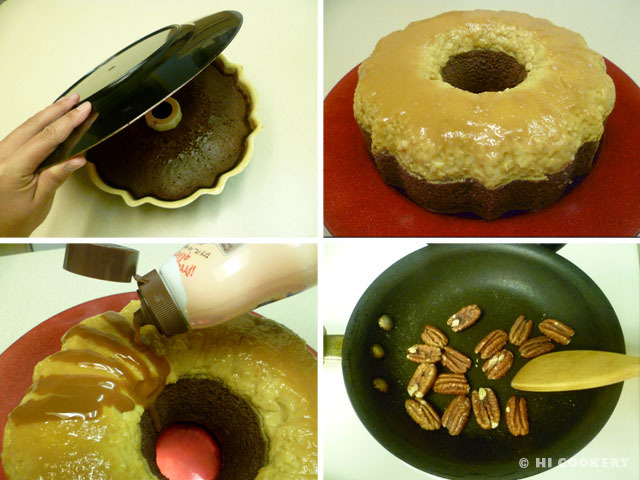 Drizzle more caramel on top of the choco-flan and let it drip down the middle hole and sides. Toast whole pieces of pecans by heating the nuts in a small skillet, being careful not to burn. Cool the nuts then place them decoratively on top of the choco-flan. Refrigerate. Slice and serve. Try a similar Filipino flan recipe posted on August 17—National Vanilla Custard Day. Search our blog for other “fiesta” foods to celebrate Hispanic Heritage Month.